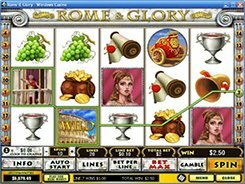 Rome and Glory is an enthralling 5-reel 20-payline video slot from Playtech. Before setting the reels in motion you should place a bet. The machine accepts up to 10 coins per line. The coin size is adjusted from $0.01 to $2. The maximum amount you can wager is $400, and the top winning is way more reaching 5000 coins. This grand award is given for five Julius Caesar symbols on a payline. The Coliseum serves as the wild and scatter symbol giving you the edge. As a wild, the Coliseum substitutes for all other symbols completing winning combinations. 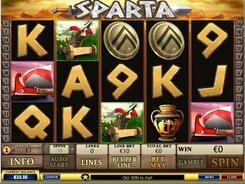 As a scatter icon, three Coliseum symbols pay out your stake at x2 your bet, four icons pay x20, and five icons pay x200. Besides, three or more scatters trigger 10 free games. 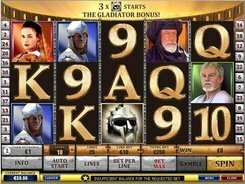 Another bonus feature is an optional Gamble round that you can enable after a winning spin. 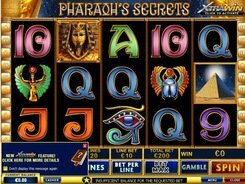 In the Gamble feature you put at stake your cash prize received during the main game, with a 50/50 chance to double up your winning or lose it altogether. You aim is to try to select a facedown card that would be of higher value than the dealer’s card. PLAY FOR REAL MONEY!